Something is off. The start of this school year feels very different. Of course, we all expected this year to be more challenging with the implementation of A.P.P.R., but something else seems to be off this year. The combination of getting to know new students, their IEPs, testing modifications, and various health/personal concerns (nothing new), along with A.P.P.R., S.L.O's, and pre-assessments (all new), seems to be making everyone crazy. pre-assessment. As a teacher, I don't know what to think. 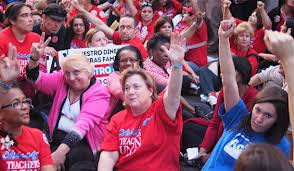 Just when I'm about to indulge in some declarations of "I'm exhausted," or "I'm so stressed," I read about the Chicago Teachers' strike, and feel fortunate. Any of us who complain about how difficult the start of our school year has been, need to remember that we didn't start the year with a strike vote. Tomorrow morning, we'll get up and go to our classrooms. We'll see our students, who are the reasons we went into this profession in the first place, and in this tough economy, we won't have to worry about missing a paycheck for our principles.